UCLA was a 16-point underdog against No. 11 USC, and lost by five, but left at least nine easy points on the field in its 28-23 loss to the Trojans on Saturday at the Coliseum. 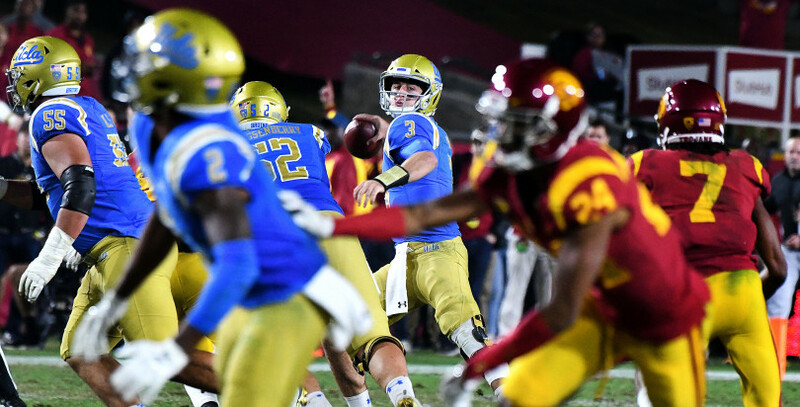 The Bruins (5-6, 3-5 Pac-12) lost their third straight game to USC and it cost head coach Jim Mora his job as UCLA announced his firing on Sunday morning. Offensive coordinator Jedd Fisch will take over as interim head coach as the Bruins have a chance to secure bowl eligibility on Nov. 24 at the Rose Bowl against California. *No full “about last night” review this week. There are a few other things to take care of this Sunday after all. 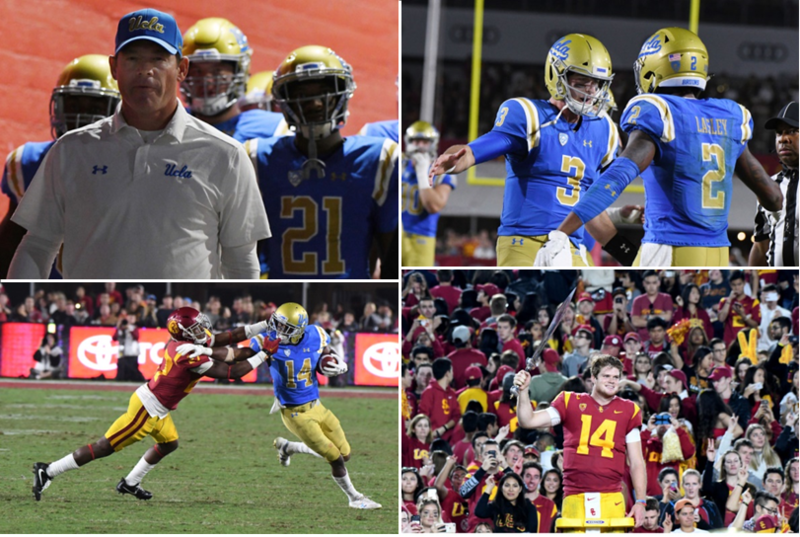 Click the photo above (or HERE) to see photos of UCLA’s 28-23 rivalry loss to USC on Saturday at the L.A. Coliseum. UCLA outgained USC and gave up a season-low in rushing yards, but still left the L.A. Coliseum on Saturday night with a 28-23 loss, their third straight in the rivalry series. The second UCLA officially wrapped up its win against Arizona State last week, the focus shifted to Saturday’s rivalry game. “Beat ‘SC! 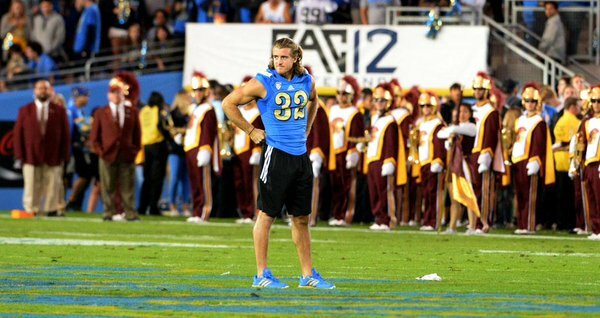 Beat ‘SC!” the crowd chanted at the Rose Bowl as the Bruins walked off the field. UCLA will try to break a two-game losing skid against USC on Saturday at 5 p.m. and has it first chance of the year to secure bowl eligibility. The game is on ABC with radio on AM 1150 or AM 570. Pregame graph: How much has the UCLA defense improved? 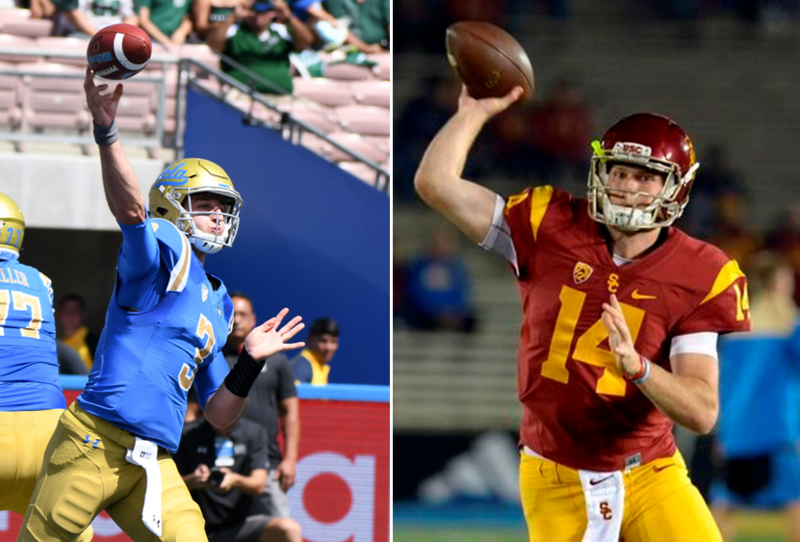 Can Rosen and Sam Darnold revive the rivalry? Video: Can UCLA pull off the upset? Getting amped for 2018 already? Here’s the 2018 schedule. Brett Hundley was 3-0 against USC based mainly on his running ability. Is Sam Darnold a bigger threat to UCLA than Ronald Jones? Does UCLA play the beef on defense to counter Jones with more playing time for Lokeni Tailoa and Mossi Johnson over Jaleel Wadood or do we want a faster lineup to defend Sam Darnold? Pick your poison? UCLA has a lot of difficult decisions to make on defense because it really does seem like a “pick your poison” type of game. But this week, Rick Wade and Tom Bradley said they’re going to gamble on Sam Darnold. The defensive end and the defensive coordinator both said the key in this game (and any game) is to stop the run and force the team into a passing situation. So that’s what the Bruins will try to do. I think Ronald Jones is probably the bigger threat to the Bruins. It was his 60-yard touchdown run on third-and-1 in the second half that signaled the beginning of the end of UCLA in last year’s game at the Rose Bowl. His opportunities could be huge facing a defense as bad as UCLA’s.